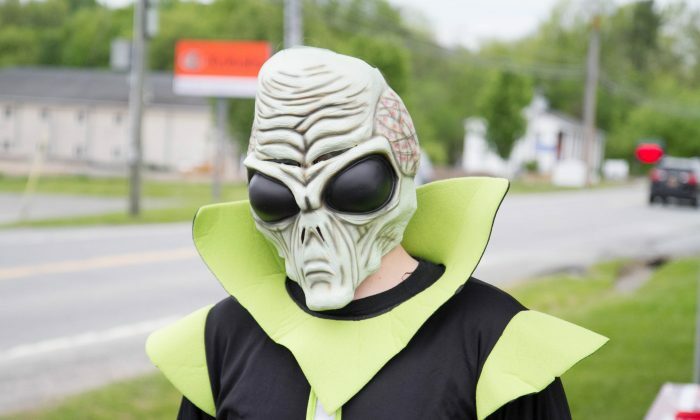 PINE BUSH—Long known for its paranormal activity and UFO sightings, Pine Bush has been home to an annual UFO Fair for the last six years that celebrates the region’s connection to extra terrestrials. This year’s Fair on May 21 brought together revelers dressed in tinfoil hats and sporting alien glasses, and those with a genuine interest in the paranormal who took the opportunity to share their interest with others. Books like the “Silent Invasion” and “Communion: A True Story,” which was subsequently made into a movie, have helped to publicize Pine Bush and give it the title of the “UFO Capital of the New York” by at least one paranormal website. Along with a street fair there was a parade, street performances, an EYE SPY ALIEN game, and lectures about UFO’s, aliens, and the paranormal. Jayne from Middletown at the UFO Fair in Pine Bush on May 21, 2016. (Holly Kellum/Epoch Times). The Pine Bush UFO patrol in the parade at the UFO Fair in Pine Bush on May 21, 2016. (Holly Kellum/Epoch Times). A vehicle from the Town of Crawford in the parade at the UFO Fair in Pine Bush on May 21, 2016. (Holly Kellum/Epoch Times). The Curves Complete Coach alien in the parade at the UFO Fair in Pine Bush on May 21, 2016. (Holly Kellum/Epoch Times). Curves in the parade at the UFO Fair in Pine Bush on May 21, 2016. (Holly Kellum/Epoch Times). Walden Savings Bank in the parade at the UFO Fair in Pine Bush on May 21, 2016. (Holly Kellum/Epoch Times). A parade participant from Walden Savings Bank at the at the UFO Fair in Pine Bush on May 21, 2016. (Holly Kellum/Epoch Times). A truck in the parade at the UFO Fair in Pine Bush on May 21, 2016. (Holly Kellum/Epoch Times). The Pine Bush Area Chamber of Commerce float in the parade at the UFO Fair in Pine Bush on May 21, 2016. (Holly Kellum/Epoch Times). A participant in the Pine Bush Area Chamber of Commerce float in the parade at the UFO Fair in Pine Bush on May 21, 2016. (Holly Kellum/Epoch Times). A car in the parade at the UFO Fair in Pine Bush on May 21, 2016. (Holly Kellum/Epoch Times). A participant in the parade at the UFO Fair in Pine Bush on May 21, 2016. (Holly Kellum/Epoch Times). Foamco’s “Home Comfort Invasion” float in the parade at the UFO Fair in Pine Bush on May 21, 2016. (Holly Kellum/Epoch Times). A passenger in the car of Foamco’s “Home Comfort Invasion” float in the parade at the UFO Fair in Pine Bush on May 21, 2016. (Holly Kellum/Epoch Times). Main Street during the parade at the UFO Fair in Pine Bush on May 21, 2016. (Holly Kellum/Epoch Times). A green cloud produced by Foamco’s “Home Comfort Invasion” float in the parade at the UFO Fair in Pine Bush on May 21, 2016. (Holly Kellum/Epoch Times). Heart of the Hudson Girl Scouts’ float in the parade at the UFO Fair in Pine Bush on May 21, 2016. (Holly Kellum/Epoch Times). Participants in the Heart of the Hudson Girl Scouts’ float in the parade at the UFO Fair in Pine Bush on May 21, 2016. (Holly Kellum/Epoch Times). A participant in the Heart of the Hudson Girl Scouts’ float in the parade at the UFO Fair in Pine Bush on May 21, 2016. (Holly Kellum/Epoch Times). Vera Friedlander and Seymour Friedlander from Monticello at the UFO Fair in Pine Bush on May 21, 2016. (Holly Kellum/Epoch Times). A robot on Main Street during the UFO Fair in Pine Bush on May 21, 2016. (Holly Kellum/Epoch Times). A window drawing on Main Street during the UFO Fair in Pine Bush on May 21, 2016. (Holly Kellum/Epoch Times). Main Street right after the parade at the UFO Fair in Pine Bush on May 21, 2016. (Holly Kellum/Epoch Times). An inflatable display on Main Street during the UFO Fair in Pine Bush on May 21, 2016. (Holly Kellum/Epoch Times). A sign in the lawn of the Crispell Middle School during the UFO Fair in Pine Bush on May 21, 2016. (Holly Kellum/Epoch Times).